Is it a wrap, a shawl with seams, a weird jacket? I don’t know but it provides warmth and drama at the same time. 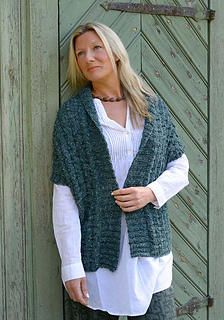 Straight pieces and a simple but interesting pattern makes for joyful knitting. The garment is shown in the smaller size on a size medium model.